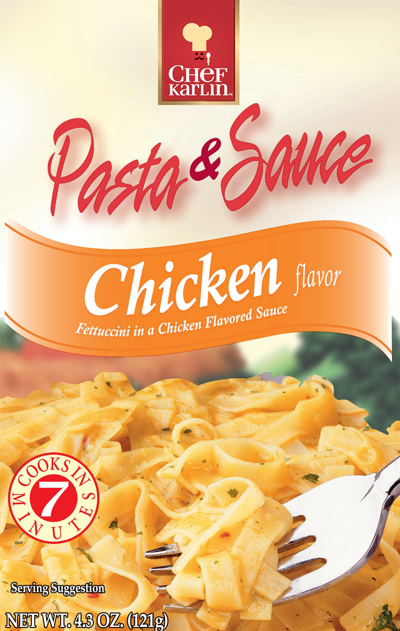 Ingredients: Enriched Pasta (Wheat Flour, Niacin, Iron, Thiamine Mononitrate, Riboflavin and Folic Acid), Corn Starch, Salt, Maltodextrin, Chicken Fat* (Rendered Chicken Fat, Nonfat Milk, Dipotassium Phosphate, Tocopherols, Propyl Gallate, Citric Acid), Onion*, Chicken*, Partially Hydrogenated Soybean Oil, Red Bell Pepper*, Lactose (from milk), Garlic*, Parsley*, Spices, Natural Flavor, Autolyzed Yeast Extract, Disodium Inosinate and Disodium Guanylate, Turmeric Extract (color) Sodium Caseinate (from milk), Paprika Extract (color). In a medium saucepan, bring 2-cups water and 1-tablespoon margarine or butter to a boil. Stir in contents of package. Continue boiling uncovered over medium heat, stirring occasionally, about 7 minutes or until pasta is tender. Let stand for 2 to 3 minutes before serving. (Sauce will thicken upon standing). In a 1½-quart microwaveable casserole or bowl, combine 2-cups water, 1-tablespoon margarine or butter and contents of package. Microwave uncovered on HIGH 10 to 12 minutes, stirring every 5 minutes, or until pasta is tender.